Switches, also called turnouts or points, are an important part of any model railroad. All the terms, numbers, and a variety of switches can be confusing if you're just getting started. Take a look at the most common types of switches and how you can use them on your layout. No. 4 switches (on right) are quite compact but useful for industrial spurs. No. 6 switches are a little more forgiving, though still very tight by prototype standards. ©2012 Ryan C Kunkle, licensed to About.com, Inc.
Like the prototype, most model switches are sized by the number of the frog. The larger the number, the longer the switch. The number equates to the length of the run divided by one unit of separation for the diverging routes. In other words, it takes four inches of length for the tracks to separate one inch, you have a No. 4 frog (or switch). Obviously, the prototype doesn't measure in inches, but the same principles apply. In typical railroad applications, most yards use No. 8 or larger switches. Mainline crossovers might be as large as a No. 22. Few people have this type of room on their layout, but their trains are also much more forgiving. Most switches are not a consistent curve radius. There are exceptions to this, however. 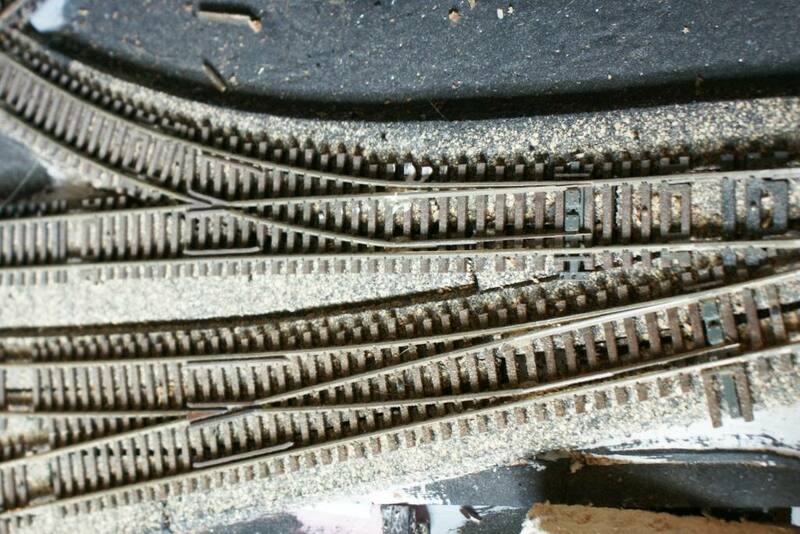 Especially in O Gauge, switches which correspond to the popular curve sections (O-48, O-36, etc.) are commonly offered to make track planning much easier. In these cases, the switches will be numbered accordingly. These switches are commonly used in the track arrangement of the same name which can be used to turn a locomotive or train. But they can be used in other applications as well. Wye switches have a distinct advantage for compact layouts. Since both routes diverge, the overall length of the switch is cut in half. For example, a No. 3 wye has the same degree of divergence as a conventional No. 6 switch. A curved turnout can save space and free up your trackplan. ©2012 Ryan C Kunkle, licensed to About.com, Inc.
A curved switch is exactly like what it sounds. Both routes of the switch curve in the same direction, with the inside route curving at a sharper radius. Most manufacturers will list the two radii for the switch, but some simply use "large," "medium," or "small." Note that you can't always judge the sharpness of the radius by the length of the switch itself. Some very long switches have a small difference in track separation but still have a tight radius. Curve turnouts tend to be more expensive than traditional switches. However, they can be a tremendous space saver on any railroad. Used selectively, they can be well worth the cost. An alternative to expensive and fixed-radius commercial turnouts is hand laid track or turnout kits. Sometimes called "puzzle switches" slip and double slip switches look more like a diamond or crossing than a switch. On the prototype, these elaborate switches are only used where speeds are low and space is very tight. The most common use is at the entrance to large passenger terminals. Because of their complexity, premade models of this type of switch are also rather expensive. They have their place on a layout if you are trying to duplicate prototype track arrangements, or if you too are very short on space and want to throw something interesting into an industrial switching area or yard. A 3-way switch is simply two switches in one. One route diverges left, another right and the third goes straight up the middle. The only real advantage to one of these switches over two conventional models is the linear space required. That being said, the saved space comes at a higher cost and greater difficulty in fixing switch machines on the tightly-spaced points. Some operators will find it more difficult to determine how the switch is aligned as well. A piece of piano wire and a track spike put some spring into a switch. ©2010 Ryan C Kunkle, licensed to About.com, Inc. The spring switch is a specialized track that uses a coiled spring to keep the switch points lined to the "normal" position. Trains facing the diverging routes will only go the normal way. Trains coming from the diverging route will be able to push the points over with their own weight. The switch then springs back into position. These are not commonly found on the prototype but they do have their uses. Common installations include the end of passing sidings or runarounds where traffic only goes one way through the switch. This saves the expense and time of having to line the switch for the repetitive route each time. These are also seldom modeled, though again, they do have their place on a model railroad. Not only passing sidings but staging yard tracks can be simplified with easy-to-make spring switches. Pre-wiring the eight connectors makes it easier to hook-up the switch motor once it is installed under the layout. Even if you don't use all of the connections at first, later improvements will be possible. ®2010 Ryan C Kunkle, licensed to About.com, Inc. Some switches come pre-wired and powered. You can also add power to manual switch machines with aftermarket motors. Model switches are generally powered by one of two devices. Twin-Coil machines use a simple twin-coiled electromagnet to throw the points. These are inexpensive and commonly found in factory-powered switches. Disadvantages include a very fast action and high, though brief, amperage draw. Switch Motors are small motors which move the points back and forth. Most are low-voltage and "stall" motors which draw a low current all the time to hold the points tight without burning out. These motors operate realistically and can often run for decades without maintenance, but they are generally more expensive than twin-coils. Which is right for you? That's all a matter of preference. And you can use different types on the same layout depending on your requirements. Take a look at these instructions for installing a slow-motion motor to become more familiar. The NCE Power-Cab features a clear display screen that makes programming an accessory decoder very user friendly. ©2011 Ryan C Kunkle, licensed to About.com, Inc.
To control your powered switches, you have several options. The most common and simple is a basic toggle switch. For twin-coil machines, a momentary-contact switch is required. A standard on-on or on-off switch will work for motors depending on how you have it wired. If your railroad uses DCC, a stationary decoder can be used to control the switch with your cab. This can put the entire railroad control at your fingertips, or you can go a step further and integrate these switches into a complete signal system or even computer control. Without adding power, trains will experience a dead zone at a switch frog. ®2010 Ryan C Kunkle, licensed to About.com, Inc.
To prevent a short circuit, the frogs of most commercial turnouts are not powered and are insulated from the other rails. This can sometimes create a problem for locomotives with short wheelbases or limited electrical pickups stalling on the switch. This problem is fairly easy to remedy with a few wires and a relay. You can solve this problem in minutes by making a powered frog. An electric relay or switch can be used to route the proper current polarity to the frog. This switch can be thrown simultaneously with the track turnout itself. ®2010 Ryan C Kunkle, licensed to About.com, Inc.
Power routing switches turn track power off and on to the diverging track routes based on the direction of the switch. There are many places where a feature like this could be a nuisance on a layout, but there are also some applications where it is very beneficial. For example, using power routing turnouts in a staging yard will ensure that your trains don't accidentally creep out onto the mainline and reduce the need for track power toggle switches and the Amperage load on your power supplies. Some companies make power routing turnouts, but they are easy to make using a switch machine, relay, and some insulated rail joiners. See how. Now that you've learned your switches and installed them completely, it's time to make them look as good as they'll work. Adding ballast to the many moving and close-clearance parts of a switch can be a challenge, but it is part of making it all come together.